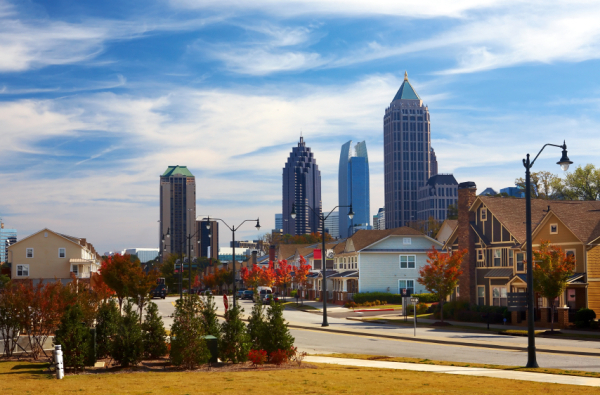 Atlanta has plenty to offer a family traveling with kids into the heart of Georgia. Enjoy educational opportunities in one of the nation’s most beautiful cities and create memories that will last a lifetime. Let our proposed itinerary guide you to some of what Atlanta has to offer children and teens. The whole family will enjoy Atlanta’s fascinating natural history museum. Fernbank Museum of Natural History stands on 65 acres of the largest urban Piedmont forest in the country. The museum’s Dinosaur Plaza is an outdoor pedestrian-friendly gathering space with beautiful plants and a family of large bronze dinosaurs, which includes information on the dinosaurs and their young. The Giants of the Mesozoic exhibit recreates life in Patagonia and Argentina, where the largest dinosaurs in the world were found. Discover Georgia’s natural history and the development of our planet in the Walk Through Time in Georgia exhibit. Children will have a blast at Fernbank Naturequest, an interactive exhibit featuring a multi-level clubhouse. Children become explorers as they walk through a virtual waterfall and discover the inside of a mighty red oak tree. Zoo Atlanta is one of only four zoos in the United States that houses giant pandas. With over 1,500 animals and 220 different species, there is plenty to see at this exciting stop. The first giant pandas to arrive at Zoo Atlanta were Lun Lun and Yang Yang in 1999. Since then, the couple have had five cubs, including two sets of twins that were born in 2013, including the first set of giant panda twins born in the U.S. since 1987. Watch a large family of playful gorillas jump around the Ford African Rain Forest. The Living Treehouse is located in the forest and houses African birds, lemurs, monkeys and guenons. Visitors of all ages will enjoy hand-feeding parakeets at the Boundless Budgies. The African Plains exhibit is home to lions, elephants and warthogs as well as a savanna landscape filled with giraffes, zebras and ostriches. Visit the Asian Forest to see giant otters, komodo dragons, red pandas and other exciting creatures. Young visitors will enjoy interacting with a variety of barnyard animals at the Children’s Petting Zoo.